Latvian horses come from Latvia and are split into three types: the common harness horse, a lighter riding horse, and a heavier draft type. They are probably from pre-historic bloodlines, and have been in development since the 17th century. The Latvian horse breed has only been established since 1952, but is believed to have descended from ancient roots. 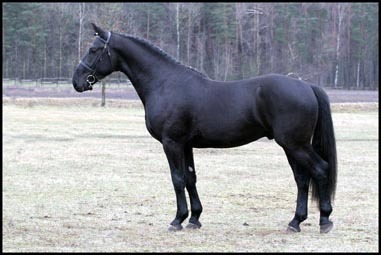 It is likely that Latvian horses are closely related to Dole Gudbrandsdal horses, North Swedish Horses, and other heavy European draft breeds. Since the 17th century, the breed has had German riding horse, Thoroughbred, and Arabian blood introduced. The core of the current breed came from infusions of Oldenburg, Hanoverian, and Holstein blood in the early 20th century. From 1921 to 1940, 65 Oldenburg stallions and 42 Oldenburg mares were imported from the Netherlands and Germany as foundation stock. There were then crosses made using Hanoverian, Norfolk Roadster, Oldenburg part-bred, East Friesian and Ardennes horses. The Okte stud in the Talsa region played a critical role in breed formation, and today the main breeding herds are at the Burnieke state farm, the Uzvere and Tervete collective farms, and the Institute of Animal Breeding's Sigulda experimental farm. There are three basic types of Latvian horse: the heavy draft horse, which is the closest to the original type, and a horse of great strength and pulling power; secondly, the Latvian harness horse, which is particularly suited to light draft work, but also makes a good riding horse; and lastly the most modern type - the Latvian riding horse which has developed through the addition of English Thoroughbred, Oldenburg and Hanoverian blood, and is a much finer, lighter type of riding horse. The riding horse type is becoming the most popular and the old heavy draft type is now rarely seen. However, the modern riding type is still able to perform well in harness, although it is not of draft strength. The Latvian as a breed is particularly versatile and the modern riding horse type has become extremely successful in the competition world of dressage and show jumping. Typically, the Lativan horses are bay, black or chestnut, gray or brown (a variant of bay), and stand between 15.1 and 16 hands high. In appearance, the Latvians tend to have a large head with a straight profile, a neck that is long and muscular and set into prominent withers. The shoulders are long and sloping and the chest high and deep. The back is straight, with a long, slightly sloping croup, and the legs are solid and well-muscled with strong joints, although rather short. Conformational problems that may be seen are cow hocks and a predisposition to ringbone. In general they have a good musculature and good stamina and endurance.